World War II era map of India. This is a beautiful 1943 or Showa 18 large format map of India, issued by the Japanese during World War II. It covers all of India and Pakistan in great detail, and includes Sri Lanka. The map offers superb detail regarding topographic and political features and notes cities, roads, and trade routes on air, sea and land. Shading is used to display oceanic depths. Includes two insets in the lower quadrants. 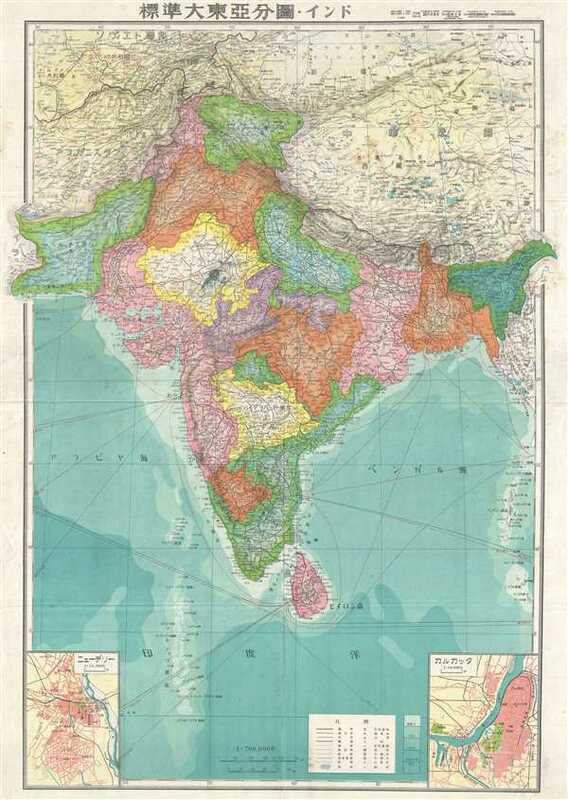 This map was issued while India was in the midst of its struggle for freedom. The British Raj however, was still in control of the country, which led to India's participation in World War II. This map was created by the Japanese during World War II and issued as part of a 20 map Series of Great East Asia Maps, detailing parts of Asia and the Pacific. All text is in Japanese. Very good. Minor wear along original fold lines. Minor toning and spotting. Accompanied by original cover no. 19.